Heading west through southern Virginia, the weather forecast indicated that this would be a perfect time to jump up on the Blue Ridge Parkway. 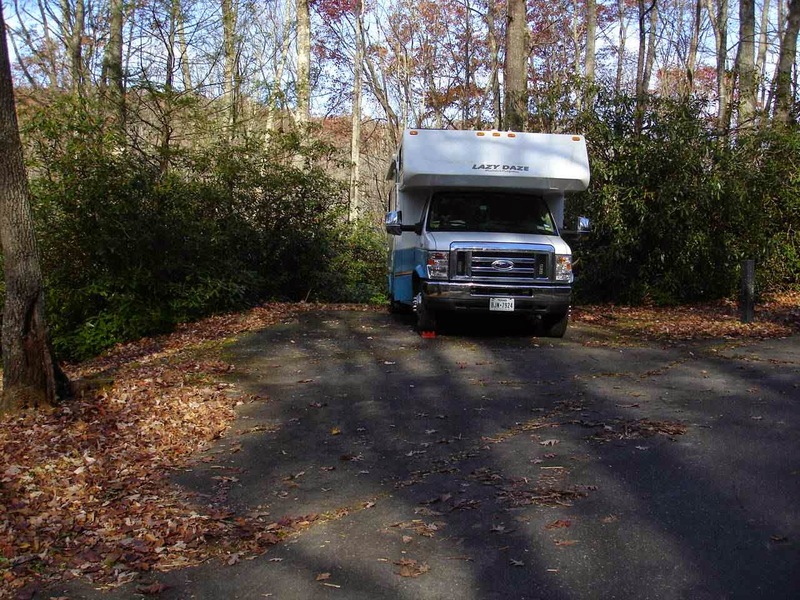 Before doing so, Jan and I make a stop at Salthouse Branch COE campground on Philpott Lake in Henry Virginia. A very nice campground with some very helpful hosts. With a calm wind, the reflections show some nice colors in the lakeshore. 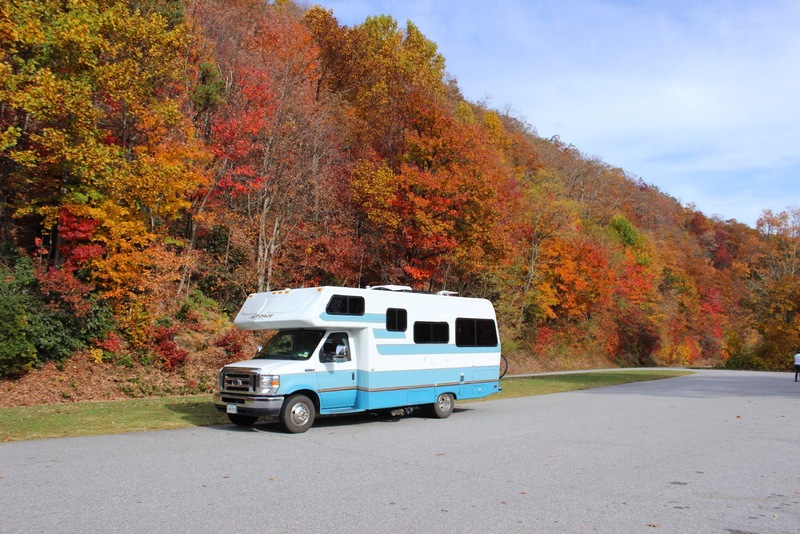 Getting to this campground, we were on Route 220 , coming through Martinsville on a Sunday. Signs said "watch for traffic backup on race day", but no backup. So we thought, "Ha", no problem. Off we go on the exit to get gas. Right into a traffic backup, right into the gas station which was at the racetrack. All kinds of people in the street, crossing the highway. Well!!!!!! Turns out, the race was just beginning at the Martinsville Speedway Nascar Sprint race. And some guy named Dale Earnhardt Jr. finally won the grandfather clock winner's trophy that he had wanted since childhood. Follow this link to the story. Dale Earnhardt story. 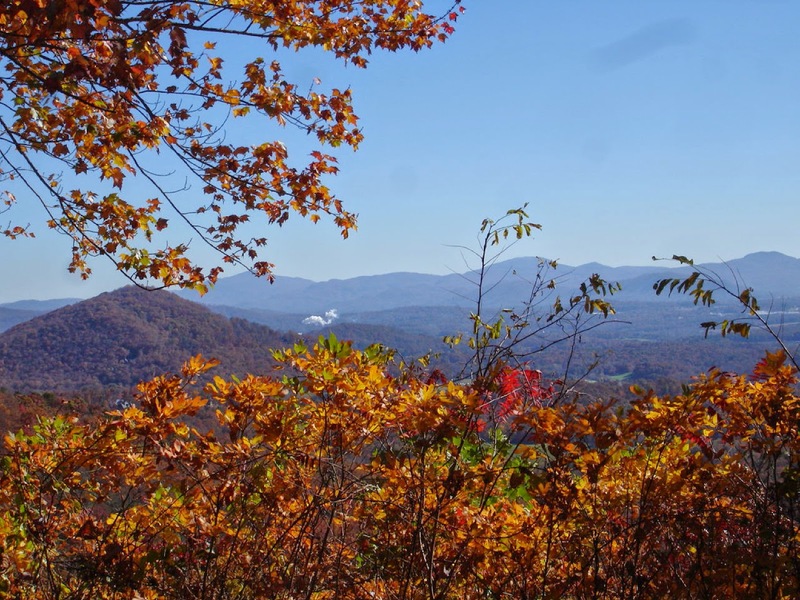 The Blue Ridge Parkway runs for 469 miles along the crest of the southern Appalachians and links two eastern national parks, Shenandoah and Great Smoky Mountains. Jan and I jump on in Meadows of Dan, Virginia at milemarker 176. 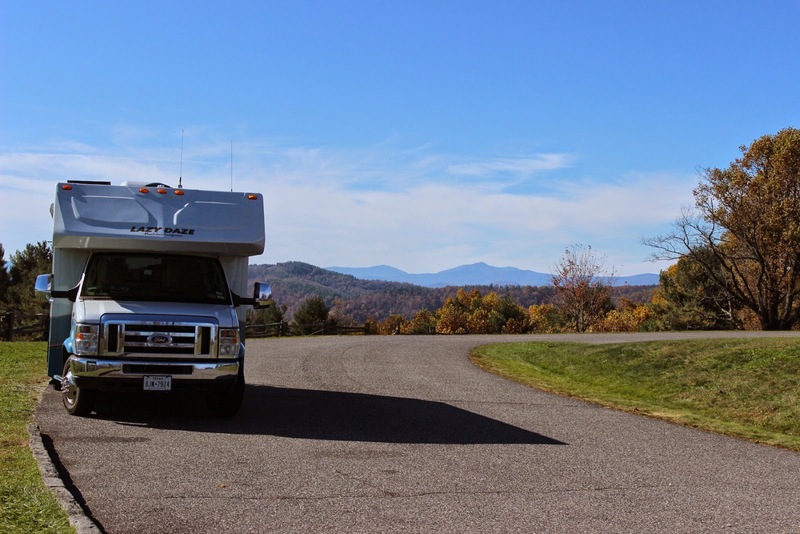 The speed limit is 45mph which is plenty for car or small rv. 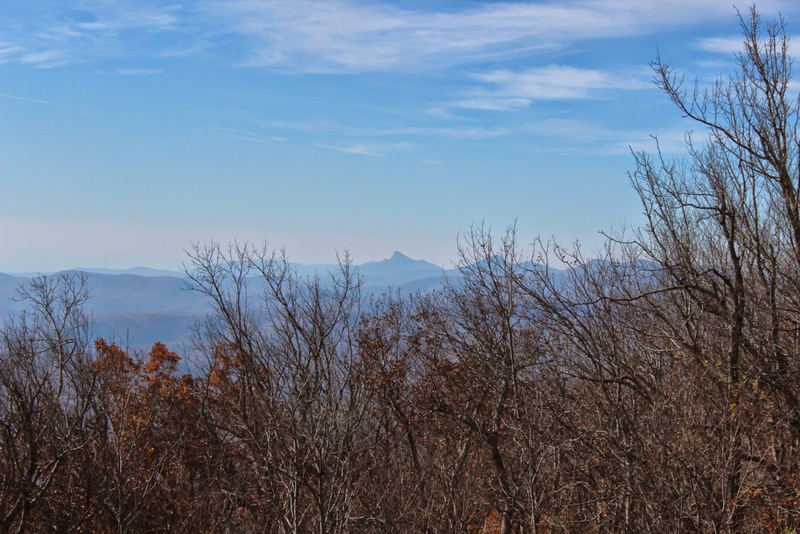 The above view is typical with the elevation going from 649 to 6,047 feet. Our trip was mostly from 2,000 feet to 5,000 feet. 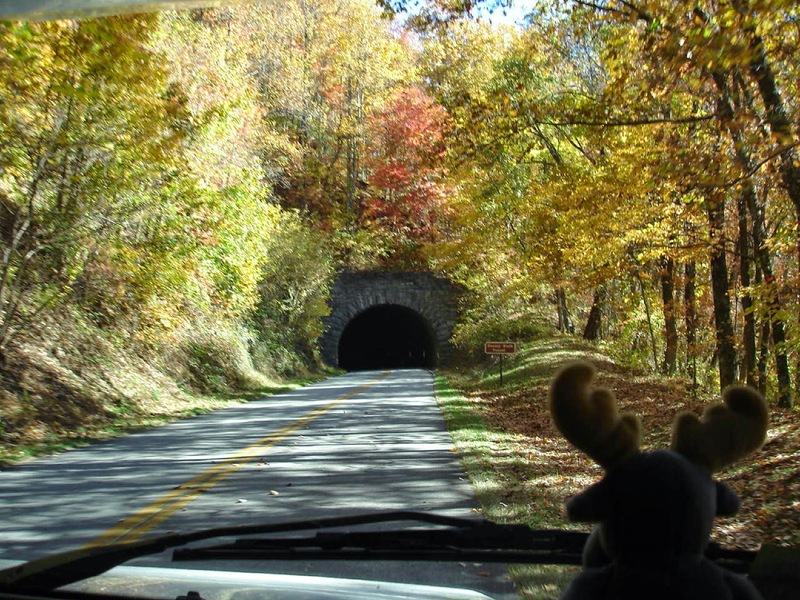 Along the road are also a number of tunnels, most of them in North Carolina in the higher elevations. The park is popular almost all year round, except for the winter. Parts of the park road are closed in winter weather with no road services. The spring season is very popular with a great number of rhododendron and other flowering shrubs. But the fall foliage season is probably the most popular. We are here just after the peak color, but there is still plenty of color at the lower elevations. All along the route are many turnouts for the wonderful vista views. Also , are many historic stops and historic homes or buildings. This is the cabin of "Aunt" Orelena Hawks Puckett. She lived to 102 years old and was a midwife, delivering more than 1,000 babies. The last delivery was in 1939, the year she died. As the elevation increases, the color dims. But the views are still spectacular! 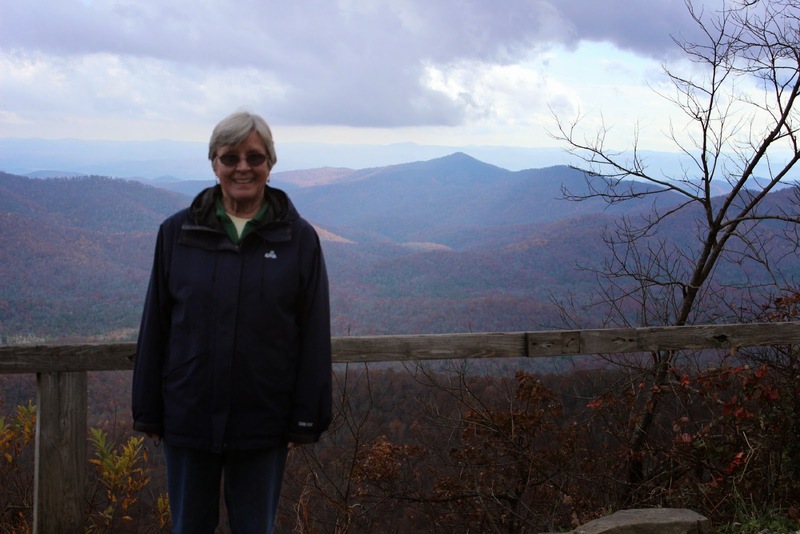 Jan and I spent two days on the Blue Ridge, for more than 230 miles. 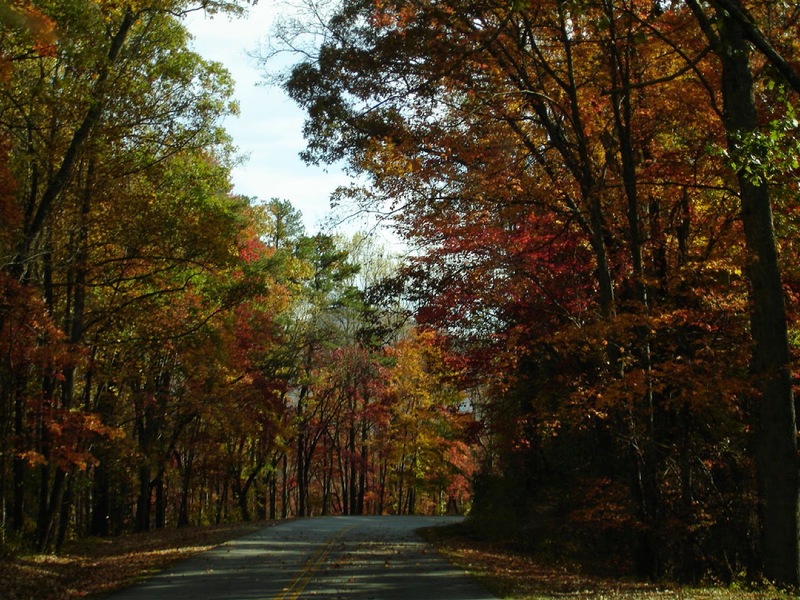 On weekdays after peak color, we enjoyed a very peaceful drive. Little traffic and plenty of parking at most of the scenic overlooks. Where do those stairs go, Jan? Interesting, some of the history near here. Some of us remember the song as sung by the Kingston Trio and that the song was the number one song in 1958. 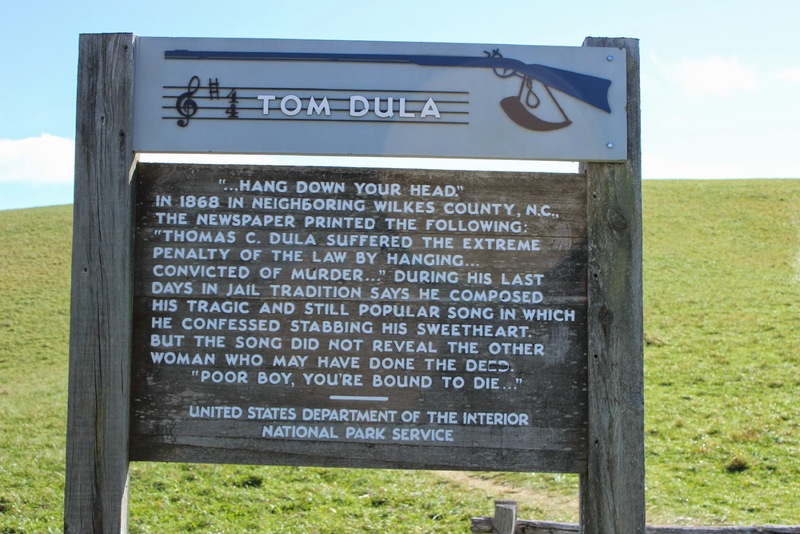 But we could never relate to you that it was based on a true story of the murder of Laura Foster in 1866 in North Carolina. Remember, you can click on pictures to enlarge. 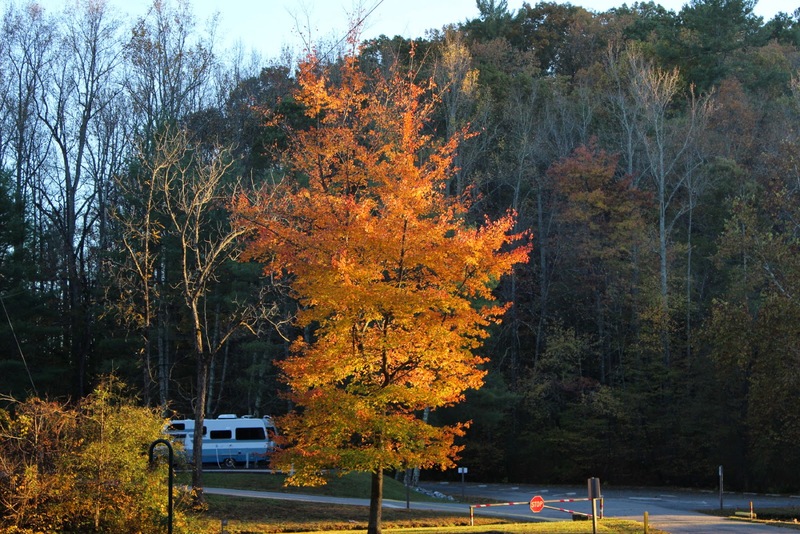 There are national park campgrounds on the parkway and also some private campground just off the parkway. The national park campgrounds are dry camping( no hookups). We found that most sites just fit Lady Blue at 24 feet. But, there were some larger trailers and motorhomes in the parks-only a very few. The charge for camping-senior pass--$8 per night. This was Julian Price Campground. The camping was comfortable. You might want to know that most of the sites were not quite level. Also, you might want to know ahead that there was no phone or internet signal at the campgrounds we stopped at. Doesn't Lady Blue look "at home"? Our second day will take us to Mount Pisgah at 5,000 feet. Most of the day will be at 4 to 5 thousand feet with many sharp curves and steep hills---often at the same time. 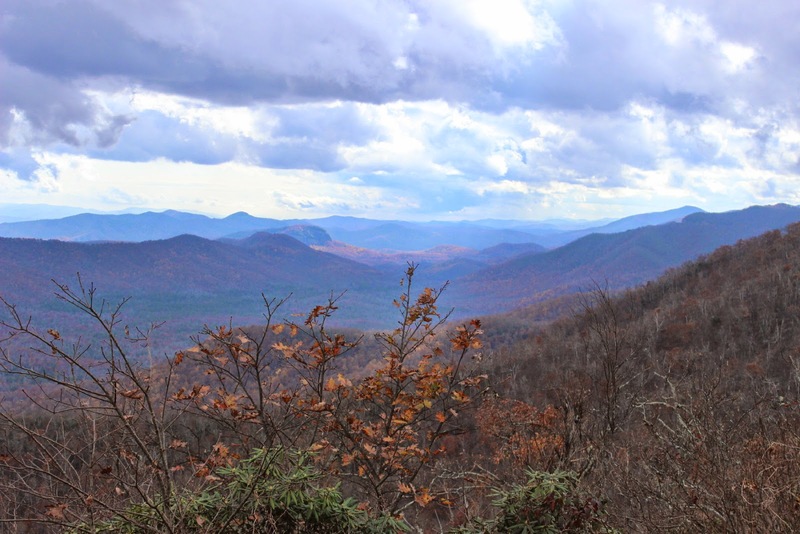 The Blue Ridge Parkway was first conceived in the 1800's , but the first construction began in 1933. 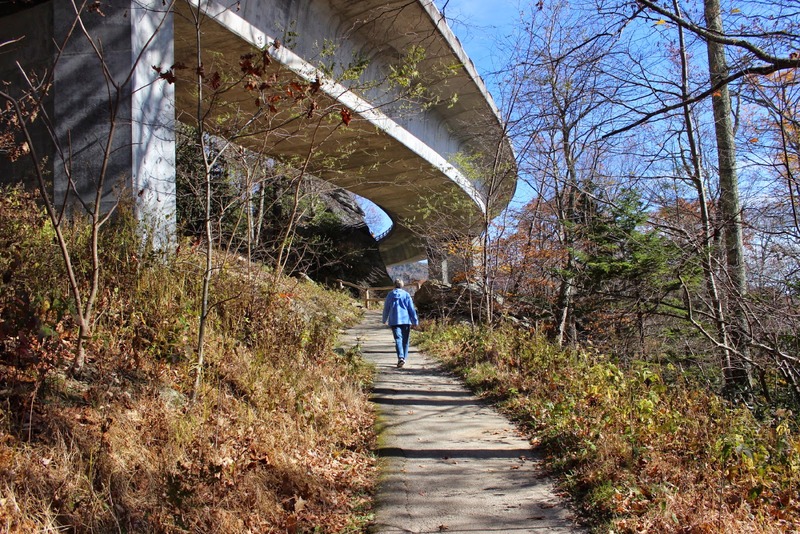 Jan is walking under the Linn Cove Viaduct which was part of the final construction in 1987. 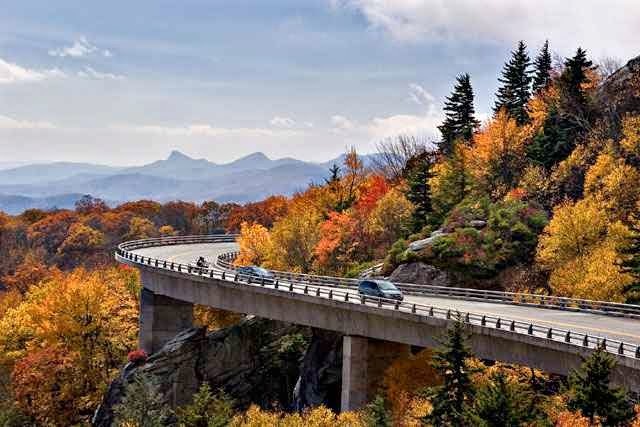 This bridge snakes around Grandfather Mountain without damaging the mountain itself. I'm including this stock picture of the viaduct. We could not stop for a picture, but here, you can understand why the bridge is something of an engineering marvel. This link will give you a little more information. 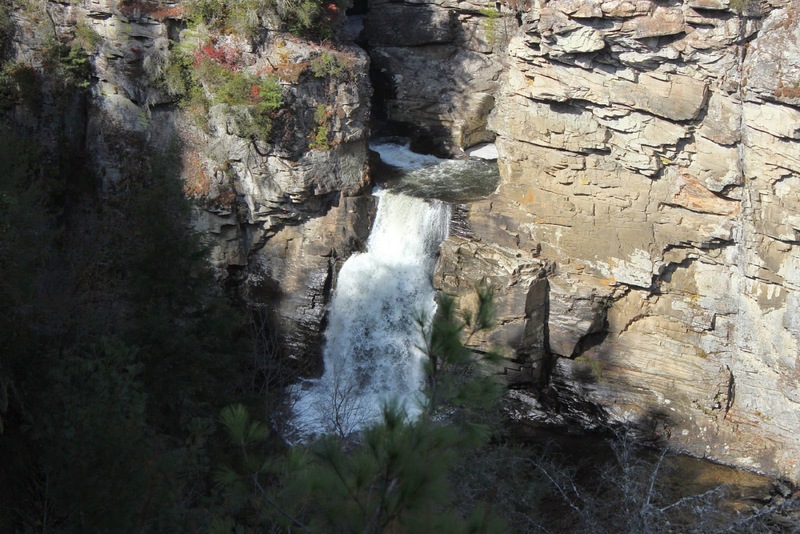 Also, along the route is a popular stop with a little hike to the Linville Falls. Lady Blue is having such fun! But , she also needs these stops for a little rest now and then. These roads are steep! Also along the way is the Blue Ridge Music Center. We had stopped there back in 2009. That would have been on the first day and we were tempted, but not this trip. They feature music history of the region and usually live music every day. Our end destination this trip is Pisgah Mountain and the Mt. Pisgah campground. Right across the street is the Mt. 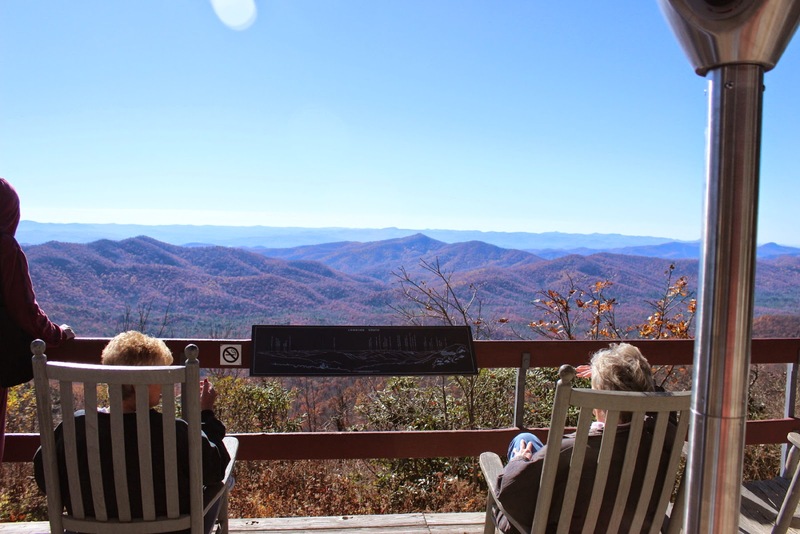 Pisgah Inn and this wonderful view. Yes, the scenery in the background looks great too!!! Mt. 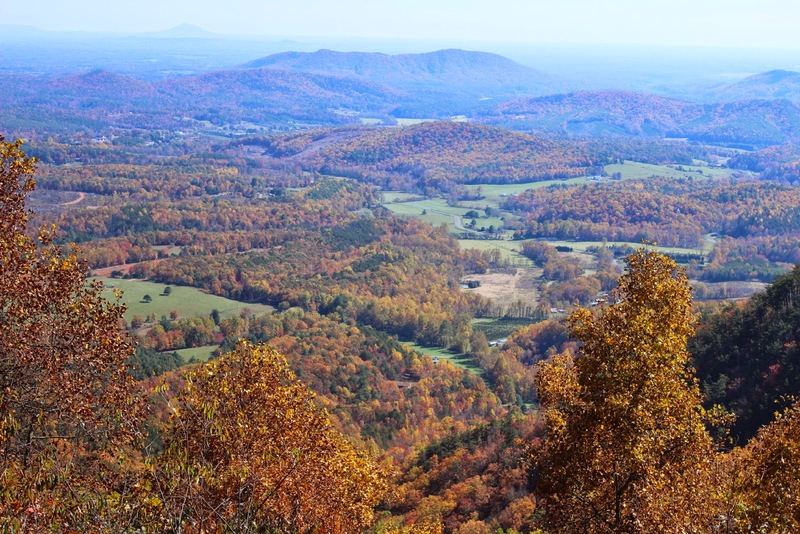 Pisgah was part of the Biltmore estate and the city of Asheville and the Biltmore Estate is only about 25 miles or so back north off the parkway. We had visited there in 2009 as well. We were tempted to stick around for the beginning of the Christmas season at the estate in about a week. We were so lucky to have a good day for this view at the Mt. 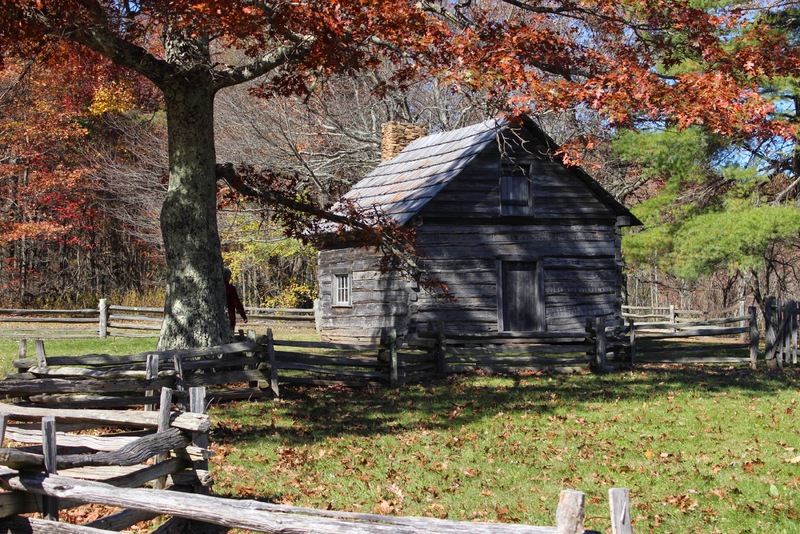 Pisgah Inn. Even at the end of the season, the Inn was quite popular with individual travelers and small bus groups. We went to the restaurant for an evening dinner and had to wait for a seating---no reservations--first come,first served. It was quite enjoyable. Jan had a grilled salmon and I had pork chop with apple chutney. All that with a nice California meritage wine and creme brulee for dessert. A must stop!! Also, nice to have a short 5 minute walk home in the woods. If you visit, you might also have one of these rockers to sit in while you wait to be called to your breakfast, lunch, or dinner. Jan and I sat in some rocking chairs to the left and waited for ours. The Inn and campground were closed a few days later for the season. They closed a day early due to a large early snowstorm that was supposed to dump 6 to 10 inches of snow on the mountains. As I write this, a good section of the parkway is closed due to weather. 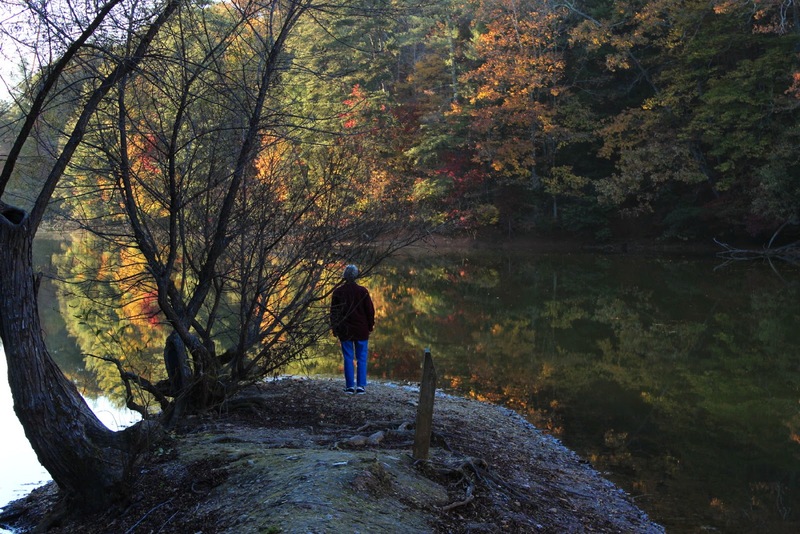 It was a very easy trip off the parkway and south to Twin Lakes Corps of Engineer Campground in Pendleton, South Carolina. 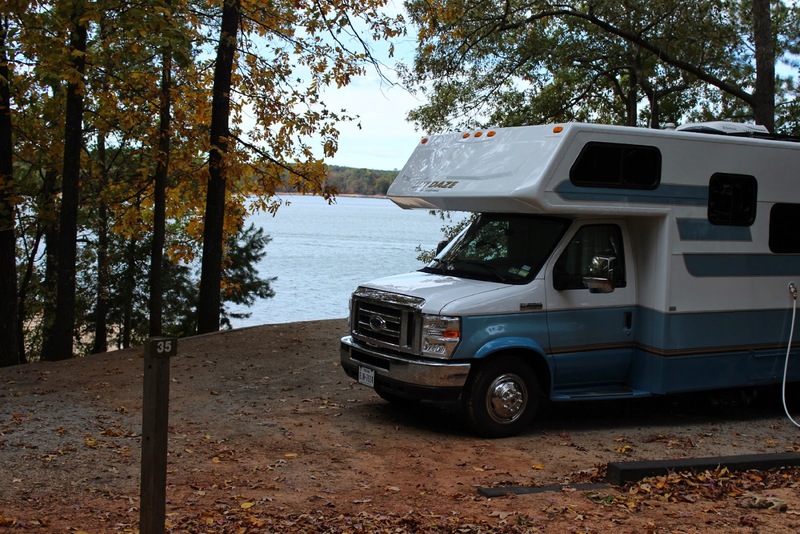 Just a few miles from Clemson University, it is a wonderful campground with very large campsites and a number of them with lake views. A little pricier than some, this is still only $13 with our Senior Pass. And all sites have electric and water. 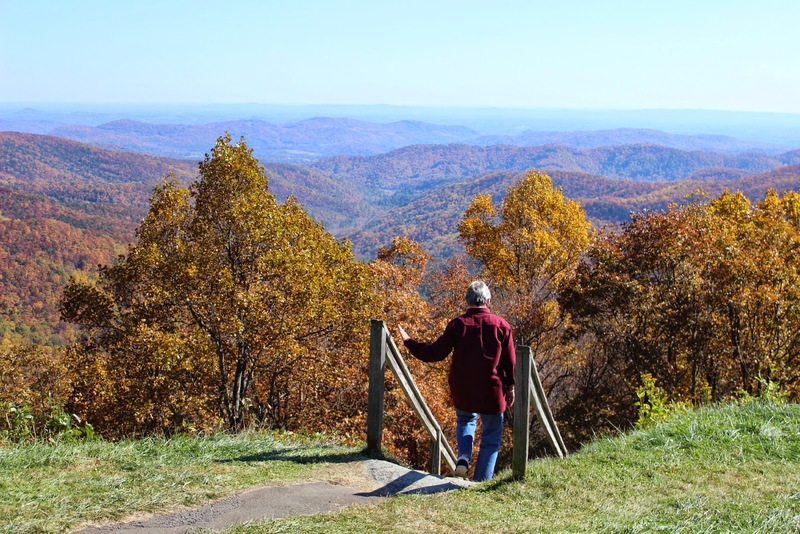 For any readers who might want more information about the Blue Ridge Parkway,this link will take you to the park homepage. Park Info You might want to click on the photos and multimedia as well as the history section.